From left: Josie Guinn, Damon Dubots, Brittney Reed. Not pictured: Austin Richardson. Brittney Reed averaged 13 points and 6 rebounds for the girls basketball team in two big wins over Temecula Valley and Great Oak last week. In doing so, she became the fifth all-time leading scorer (1,228 points) in school history as well as the third all-time leading rebounder (737). Damon Dubots is the team leader in scoring (15.2 ppg) and rebounding (8.8) for the boys basketball team. Josie Guinn had a goal in each game as the Broncos girls soccer team went 2-0 last week. Senior goalkeeper Austin Richardson posted two shutouts last week, including a huge save against Great Oak Friday night in the last minutes of the game to preserve a scoreless tie. 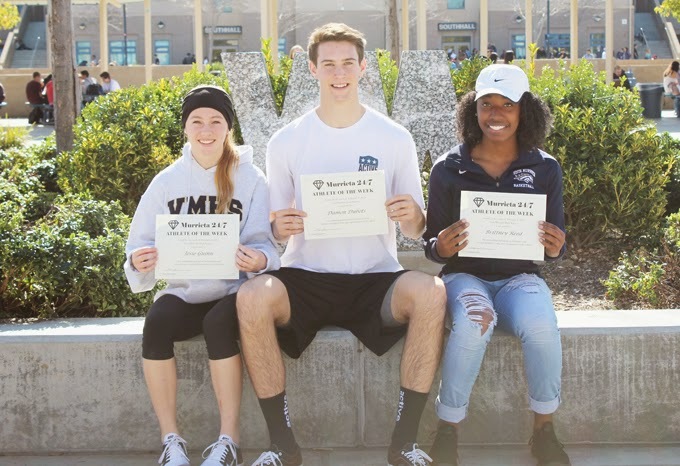 These athletes will be eligible for selection as Vista Murrieta High School's Athletes of the Month, which will be announced next week.